The new ISO 26262: Still fighting an old war? Toward the ISO26262 update: Still fighting an old war? Next year should see the publication of the second edition of ISO 26262, the functional safety standard for electrical and electronic automotive systems. The new edition will take greater account of the development of the silicon that resides within those systems. It will also broaden the range of vehicles covered to include trucks, public transportation and motorcycles. In the run-up to its publication, Tech Design Forum will look at what revisions to the standard will mean for automotive IC design. But this series begins by looking at two areas that do not fall within the scope of its second edition, though they are among the hotter topics in automotive design: autonomous vehicles and security. “There is more in there on hardware design, and that’s good because the current edition is very hand-wavy on that. But in many other ways, it’s still fighting the last war,” says Robert Bates, Chief Safety Officer for Mentor Embedded, which provides a full AUTOSAR stack among other automotive offerings. Bates argues first that when it comes to autonomous vehicles, the second edition of ISO 26262 still will not address these concerns. The ISO committee is going to take at least another year before they will release a new standard and recommendation on autonomous vehicles. 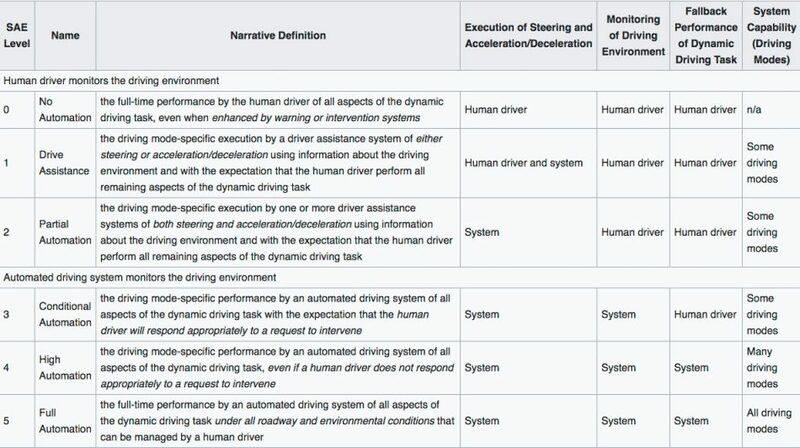 When they do, it will only provide recommendations on reaching as far as ‘Level 2’ functionality, and not the type of ‘Level 3’ and ‘Level 4’ requirements that will truly pave the way for self-driving or self-correcting vehicles (see Figure 1 for a description of the five autonomous driving levels). This kind of pragmatic compliance flow comes up short, however, when the system’s AI and machine learning content begins to increase. Security is similarly absent from the next version ISO 26262, which again may strike some as strange. Bates’ view is that ISO 26262 has provided that kind of necessary common ground in other areas of automotive safety-critical design. “I can be very critical of 26262, and you do want to draw attention to its limitations. However, it has also had and will continue to have a lot of value. Creating the same kind of environment for security would make sense. So, who would have thought it, but a standard does not go quite as far as the technology. The ISO system itself is part of the issue here – typically standards come up for review every five years. Consider what has happened to the ADAS market in that short time and how quickly demonstrators that reach toward Level 5 autonomy have emerged. And it has long been the case that analyzing the strength of any standard has often had to begin, as here, by looking at what it does not yet address. One Response to Toward the ISO26262 update: Still fighting an old war?